Digestive Enzymes Clinical Strength helps me handle foods that would normally upset my stomach. I had tried a sample of this and it was SO helpful! I was so impressed that I had to buy a bottle! I've been using Digestive Enzymes by Innate Response Formulas for 2 weeks and I no longer use Prilosec. Almost everyone has heard this saying‚ but it’s not entirely true. Instead‚ you’re the nutrients your body uses. Just because you eat healthy and nutritionally rich foods‚ it doesn’t necessarily mean that your body is receiving the expected. Your digestive system is complex. 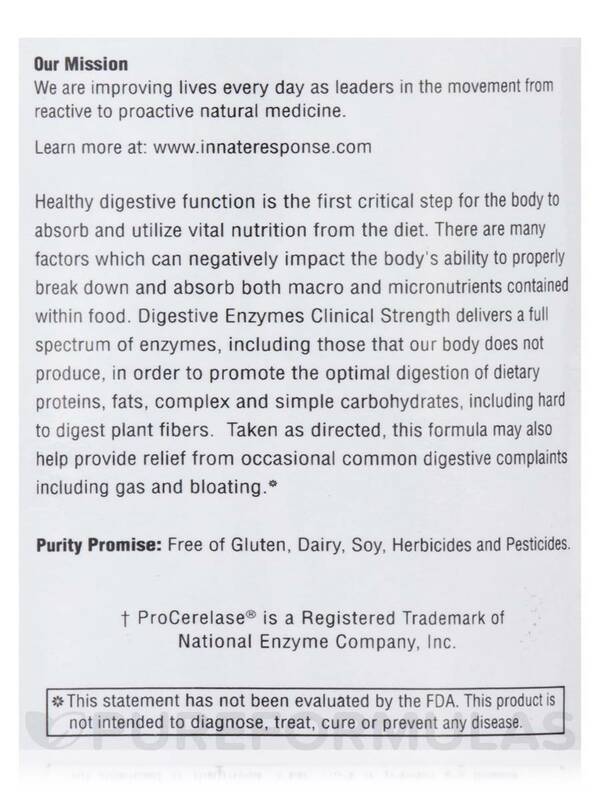 This is why Innate Response Formulas’ Digestive Enzymes Clinical Strength Capsules may be just what you need to help improve your digestion. This formula is a broad spectrum supplement that contains a number of proteolytic‚ lipolytic‚ and carbohydrolytic enzymes specifically chosen to help support a compromised digestive system. 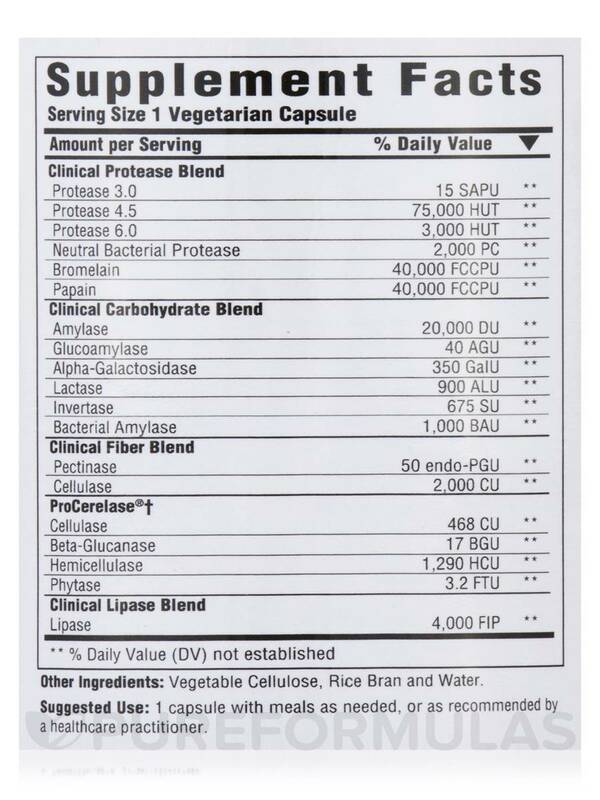 Protease is an enzyme that helps your body break down protein. Bromelain and papain come from pineapples and papayas‚ and also work to break down proteins. Amylase is another enzyme‚ which is produced in the pancreas and helps break down starches. Lactase is one of the most well known enzymes: it’s responsible for breaking down lactose. If you’re lactose-intolerant‚ your body doesn’t have enough lactase enzymes to properly break down lactose‚ meaning that you must stay away from dairy products and other foods that contain it. Invertase is used to metabolize and digest sucrose‚ another type of sugar. Cellulase isn’t naturally produced by your body‚ but it helps you digest the fibrous material found in plants that you’d normally be unable to absorb. This makes cellulase a vital enzyme in your daily diet. Lipase is an enzyme that’s produced in the pancreas and helps break down certain fats during the digestive process. This formula also contains ingredients such as glucoamylase‚ pectinase‚ xylanase and phytase. 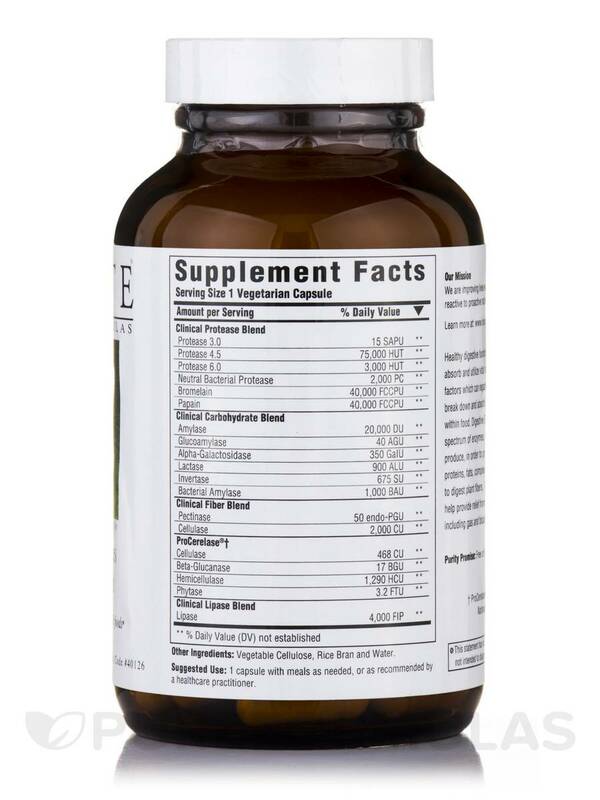 This supplement is thought to be especially effective due to the formula’s ability to survive in the stomach. While most enzymes become ineffective due to stomach acids‚ the enzymes in Digestive Enzymes Clinical Strength remain active and able to work for you. Other Ingredients: Vegetable cellulose‚ rice bran and water. Purity Promise: Free of Gluten‚ dairy‚ soy‚ herbicides and pesticides. Made in USA / GMP Compliant. 1 capsule with meals as needed‚ or as recommended by a healthcare practitioner. This product has helped with my acid re flux and in general my digestion. Along with a good diet I am feeling better all the time. 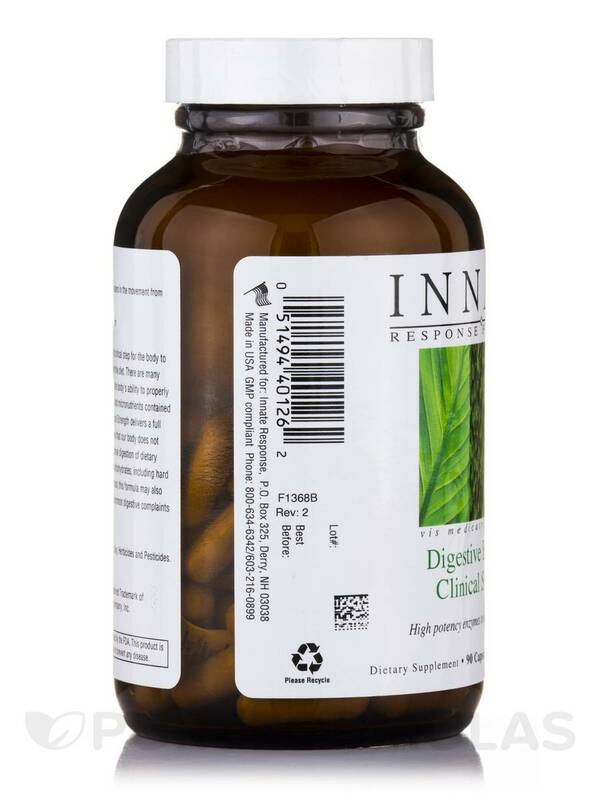 Digestive Enzymes Clinical Strength works great for indigestion. I'll take before eating a heavy meal and it truly seems to help me digest quicker. 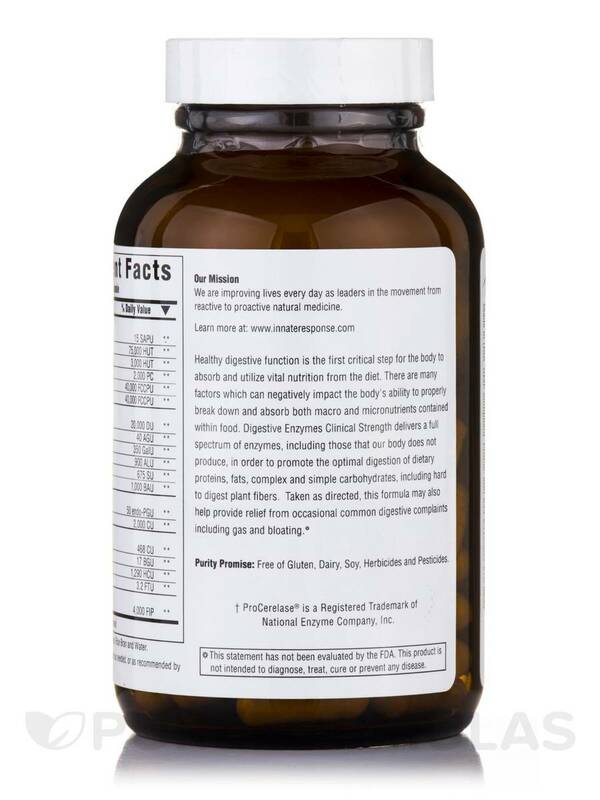 Digestive Enzymes Clinical Strength by Innate Response Formulas really do seem to be extra strength. I previously used zypan but I find I can eat spicy foods and others that would be hard on my system. I got a free sample with another order and I’m glad I did! I received a sample packet of Digestive Enzymes Clinical Strength by Innate Response Formulas with another order off of pure formulas. I tried them and they made my stomach and digestive issues feel so much better that I ordered a bottle. These actually work and seriously make such a difference with my digestion. I feel so much better taking these! Digestive Enzymes Clinical Strength by Innate Response Formulas are easy to take in my purse and I just need one capsule for each meal. I can now eat out with less digestive upset than with my former digestive enzymes. Only need one capsule, easy to swallow, easy to keep with me for eating meals out. For the price to be so high, you would think Digestive Enzymes Clinical Strength by Innate Response Formulas would be a quality product. Not! I purchased this because I was having alot of digestive and acid reflux issues. This product is supposed to be high potency and clinical strength, but it isn't. This product did absolutely nothing for me. If I could rate it zero stars I would. I felt I wasted my money. We got a sample pack of Digestive Enzymes Clinical Strength by Innate Response Formulas and gave them to my elderly Mom who has serious digestive issues/problems. She took them before a meal and felt so much better on the first use that she wanted us to buy her more. We are so happy to know of this product. Digestive Enzymes Clinical Strength by Innate Response Formulas definitely helps those of us who need help breaking food down! It's been a life saver for me! 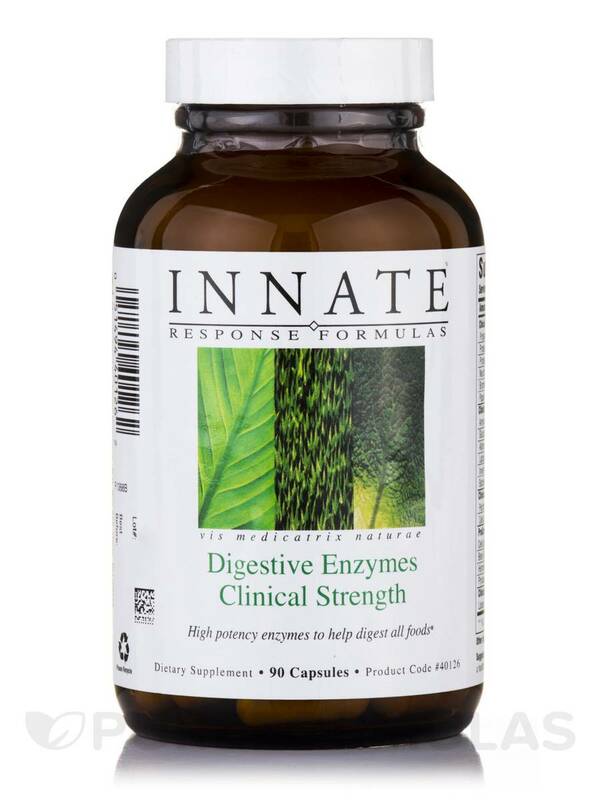 Digestive Enzymes Clinical Strength by Innate Response Formulas was sent to us as a trial. The small package made it's way around our kitchen for months. I had a belly ache and noted the trial package so I took it. My stomach ache was gone in minutes! Almost instantly. I mentioned this to my wife and she ordered some. We both get massages once a month and the masseuse noted how much less congested our muscle tissue was. "What have we been doing differently?" She asked. We told her about this digestive enzyme. She now is a distributor because she has turned other clients on to it and has seen the same results! So yes, this is a good product! This is effective in helping the digestion and keeping inflammation and muscle congestion managed. Basically, it's pretty expensive but the pay off is worth it.